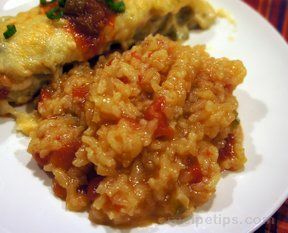 With the creamy texture of risotto this Spanish rice recipe is the perfect complement to tacos, enchiladas or burritos. 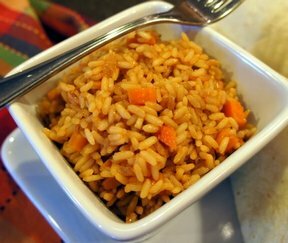 You could even add some browned ground beef to make it a meal in itself. Heat the oil over medium heat. Add onion to sweat. 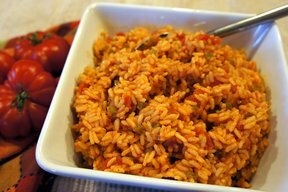 Add the rice until lightly browned. Add bell pepper, if desired, and cook 5 minutes. Add hot broth, salt, chili powder and diced tomatoes; bring to a low boil. Cover and cook 30 minutes. 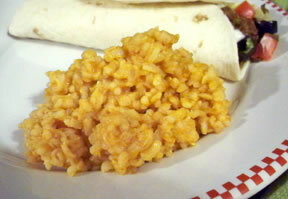 "A creamy tomato risotto is right! Loved this with the beef enchiladas we had last night. If you like spice like me you might try adding a jalapeno in with the green pepper. I am going to do that next time."